I set out to shoot a roll of black and white film. It is a quick trip from my place on Inonu Street to the large square in Konak. The transportation system is great. It is also free for those over 65. I am never one to object to free services. I like the idea of getting something back for one’s taxes. I will take pictures in the evening using Ilford film and push it to ISO 1600. A rainy day. Just off the metro, heading for Kemeralti, the rain picks up. Coming down steadily. I stop at a small tea place under a canvas awning. I have tea and wait for it to stop, but no luck. I hear thunder. The wind picks up. I am being sprinkled with small drops, wondering if I will get wet. Water gathers in the small alley between shops. The street is about to flood. Three elderly women appear. They are looking for shelter from the now steady downpour. I invite them to sit at my table. They immediately take out their cigarettes and light up. I don’t mind, really. They are clearly smokers. They offer me more tea. When their food arrives, cheese sandwiches and chips, they politely offer to share with me. I decline. It is only a social gesture. But they are kind to me. We lament about the rain, which is now a steady downpour. The tea shop guy sweeps the water, now building up, away from the table. Shoppers pass, under umbrellas or quickly dodge between shops. I am bored and want to get out of here, but must wait. The women finish their food and light up again. They are clearly seasoned smokers. Even the deep lines in their weathered faces testify to that. I am glad that I never took up the habit seriously. After half an hour, the rain lets up. The women leave. I too venture out, even though it is still raining lightly. At Humza Rustem photo shop, I buy film. It is the only shop that I know of still selling film in Izmir. Film photography is dead here. I leave four eight by ten prints for framing at the frame shop. I have just made them using my old Czech Soviet-era enlarger. It is an Opemus 5 and still works fine. I will not get the framed prints today, not wanting to carry them. I walk to the big square around the clock tower and small mosque. Here people are taking pictures, mostly selfies with their cell phones. They feed the birds with small cups of wheat sold in the square. There is a nice atmosphere after the rain. The sun is almost breaking through the clouds. The scene is worth a couple of pictures. Bored with the routine, I catch the bus to Alsancak, a traditional and more upscale part of the city. The long mall for walking between shops is crowded. People seem to always be outside in Izmir in all kinds of weather. I am hardly in the mood for photography here, knowing the pictures will look better in the evening. I love the small streets in this area with the old traditional houses with balconies. Now the streets are filled with small cafes and bars. The crowd is mostly young, university students, who fill up the small restaurants and trendy bars. Downscale working-scale youth are nowhere around. Anyway, the prices are generally out of their range. I try a new pub, Varuna Cezgin. It is an unbelievable place. The walls are lined with shelves packed with books. And magazines. But no one reads inside. The place is almost full of university age youth, mostly drinking beer, eating. Some sit at tables outside to smoke. A vast assortment of beers is available. They advertise Mexican tapas on some days. Inside, the place is heavenly. I sit across from one of the bars. There is another larger one at the far end. I order a draft beer. And knowing that I need to eat something, a burger. From my rather high perch, a sort of wooden bar chair, I can shoot some pictures. The beer is cold, delicious. The burger is good, along with chips. I love the atmosphere. I use my Leica 6 film camera, which is good for pushing black and white film in low-light settings. No need to ever use a flash. There is plenty of light and I can go down to one-fifteenth of a second, hand-holding the camera. I marvel at the affluence of these youth in the beautiful coastal city. They certainly seem to have plenty of money to spend and plenty of leisure. Not a care in the world, it seems. Many of them will follow their father into their family businesses. They seem much happier than those of us who in the l960s Vietnam War era. I certainly never knew such a thing in my youth. Lacking money in my university days and always feeling the need to use my time to study. I knew that it I flunked out of the university, as some did, it was all over for me. There was nothing to fall back on. I was from a small rural farm-town. The only future there in north Missouri would be in pig farming. And in those days, I would have been sent to Vietnam. Not only do they have plenty of leisure, these youths seem completely free of guilt and the sin-trip that was laid upon me and others in the Bible-belt of the Mid-west of the USA in the l950s. The young women are beautiful with mostly lovely figures. They mostly come from affluent families. I finish my food and beer and take more pictures. I thank the guys running the place, who know English and are friendly. It is lovely to be young like them. Out on the street again, dusk is falling. I walk out to the Kordon and the sea. One can get a good shot of the ferry boats coming from the opposite side of the city across the harbour. I do some street photography in the small streets. The small cafes are filling up mostly with youth. Where do they get all that money? How do they have so much leisure time? It is a mystery to me coming from my background. Rural America. I slowly gravitate toward another pub, a beautiful place. It is a classical and historical gem inside. Sardunia has old fashioned tables and chairs, right out of the past. Beautiful cold draft beer. Colourful designs on the old stained-glass windows onto the street. I feel like I have stepped back into some old German pub in the l930s. Stepping back in history when I sit and sip that gorgeous cold draft beer. If there is a heaven, this must be it. Which reminds me of a thought I sometimes have. If there is no beer in heaven, why the hell would I want to go there? Attractive young women, university students, flit around, waiting for the evening crowd to appear. The place will fill up later. I can only drool over their beauty. I speak to them in Turkish. But I find that they knew English. They are just not used to speaking it. These youths are incredibly bold, intelligent, talented and full of confidence in themselves, it seems to me. There is the absence, it seems, of that stupid, that dumb guilt trip that is often put upon American youth in the Bible Belt if America. Lucky people, I think. It reminds me of a British citizen living in Izmir who sometimes sang Beatles songs along the mall for his beer money. I think he was finding it hard to go back to England. Between songs, he told people that they “really had it lucky” here. They did not know how lucky they were. He was obviously enjoying the city. When I see the youth, who are getting a university education, I think the country must be doing something right. And not putting them under the burden of student debt as in the USA. Still unemployment is a problem for many here. Neoliberal economies have struck everywhere around the globe. On the other hand, the Turkish economy had the highest rate of economic growth in the developing world in 2017. Once the IMF was paid off and kicked out of the country, things seemed to work a lot better for economic growth. Out of the debt trap, Turkey started to finance the IMF to the tune of several billion dollars. I had always thought that the key to successful economic development was keeping the US out of the country, as much as possible. So not very surprising. I take some more pictures in the low light of Sardunya. Using one-fifteenth of a second at f 2.5, I can get a reasonable exposure without using a tripod. 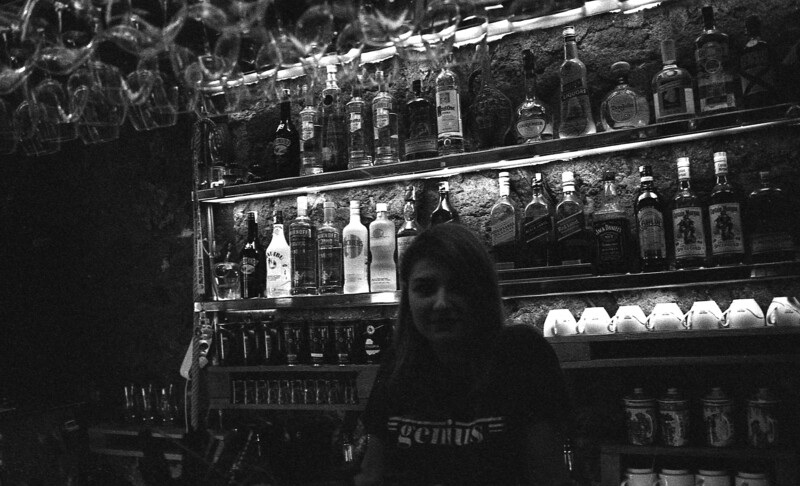 The young girls let me take their pictures behind the bar. They are so lovely. Regretfully, I am over the hill. I wish them a pleasant evening and hit the street. The crowds are just starting to flood into the streets. I finish the roll of film out on the street and head back. Later in the evening, I develop the film. The black and white images are lovely after scanning the negatives. It was a successful day with my Leica. I love black and white. Today digital colour has taken over almost all of photography and most youth expect to see the image instantly in the back of the camera. They have no idea about a film camera, so quick has been the change.